Emergency Drain or Odd Toilet Backups? Call On Plumbing Experts NW, 24 Hours a Day! A clog in your home's sewer line or any sort of failure of the sewer line itself can cause serious issues for your property and your family's health. Waste "backing up" into tubs, sinks, toilets, and basement drains is scary and should be handled as quickly as possible. 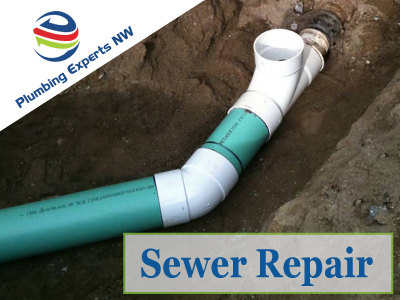 If you even think you may have a sewer line clog or need sewer repair in Lynnwood areas, call on Plumbing Experts NW. Even if you're not sure what's wrong with your drain---we'll be glad to help. We work to figure out clogs and give you an accurate idea of what's going on and how we'll fix it. There are other symptoms to watch out for as well, like sewage appearing in your yard. Plumbing Experts NW will give you options for clearing up any clog situation and/or repair your sewer line. We have sewer cleaning tools for snaking, grinding roots as any known rooter service does, and we can utilize sewer camera technology also. We'll clear your main sewer drain and find out if there is any kind of a crack, break, or complication with the sewer line itself. After clearing the line and getting a good look with a sewer video camera, we might just find that there is a break down in a section or an even larger problem requiring our sewer repair services. Sewer breakages are more common with older homes and quite possibly with some sewer repair in Lynnwood. Sewer line material of old will break down at some point and collapse or will more easily allow root intrusions. Plumbing Experts NW presents you with options for repair completely, or we might be able to help you manage the issue in other ways. When you need it, we are the sewer repair Lynnwood WA property owners count on. At Plumbing Experts NW, your satisfaction is always totally guaranteed, so you can be assured of a job well done, whether it's a sewer cleaning or a necessary, but unfortunate sewer repair situation. Reviews of the Plumbing & Sewer Repair Lynnwood is Glad to Have! Lynnwood plumbing problems arise and we take them on for you. Call us today for fast and friendly plumbing service. Water Leaks are damaging and annoying. We can help locate your water leaks and fix them fast. Sewer video inspections help you know your options when handling an old or damaged sewer line. Let us help you! We repair water heater issues & and replace if necessary. Water Heater Repair in Lynnwood with Plumbing Experts NW. Plumbing Experts NW can clears drain clogs in Lynnwood WA, whether it's a clog in a sink, a toilet, or in your main drain line. We know sewer repair in Lynnwood! Clearing Sewers out, repairing or replacing Sewers...we got you covered!